Indoor grills are a must-have in every kitchen now. And if you don’t have one yet, then it’s about time that you got one. Owing to that cause, we are going to review one of the more sought after indoor grill in the market today: the Hamilton Beach 25331. We have heard some great things about it, and thus we are here to find out if the Hamilton Beach 25331 really is worth all the hype. Sit back and read through to find out about the features and functions this grill has up for the offer, and be the judge yourself. Let’s start! We also touched this unit in our best indoor grill review. At first sight, the Hamilton Beach 25331 indoor grill looks like any old, your average grilling machines. Simple, basic and plain. We, however, wouldn’t underestimate it just yet if we were you! This grill is your average indoor grill alright, but only more powerful and refined. It’s is perfect for countertops or any corner of your kitchen workstation since it is so light and compact. The Hamilton Beach 25331 measures just 14 x 7.5 x 13.8 inches in dimensions, and weighs a mere 10.1 pounds. In other words, this is your ideal machine if space is the premium for you. Being of such size and weights also makes it very favorable for travels. Win-win so far. Let’s see what else we have. The Hamilton Beach 25331 offers you a large 100 square inch cooking surface which can easily grill food for up to 4 servings at a time. It is, therefore, a machine great for small families and students at dorms. The grills are non-stick coated, meaning your grilled and charred food will leave back little to no residue behind and is this very easy to clean and use! 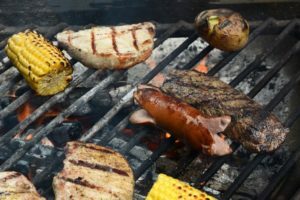 Keep in mind that the grill plates do not come off so you will have to use a damp piece of cloth to wipe away the grease and scraps. It furthermore includes a high-cap drip pan which collects all the unnecessary grease and fat from the food. Perfect for health-conscious eaters! The drip pan is moreover easy to use and dishwasher safe. 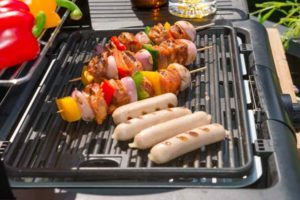 If you are wondering what makes the Hamilton Beach 25331 indoor grill different from your average grills, then it is its heating element which can do some excellent seats on your food; hence, the name. This grill can get as hot as 500 degrees Fahrenheit, which is clearly screaming hot. This super hot cooking surface it what sears your food, especially proteins like steaks and fillets, to lock in both moisture and flavor. And if you are one of those people who loves good eat even on a rush, then the Hamilton Beach 25331 indoor grill caters to your fancy as well. Its advanced heating system can cook through most food in less than 10 minutes or so! Apart from the dishwasher-safe drip trays, the Hamilton Beach 25331 indoor grill also has a few more tricks up its sleeve that makes your experience using it more seamless and fun. The grill comes with a thermostat, meaning you are in control of the temperature being used to grill the foods. Using a controlled and precise temperature is probably the best way to ensure that your grilled meats and veggies are done to the perfect doneness! It furthermore offers you indicator light and digital display, which let you makes viewing the progress and status of the grill very easy and convenient. And finally, we have the timer. Now it may count down just fine but the problem with it is that it keeps on counting and running the grill even after the time’s up. The Hamilton Beach 25331 indoor grill, like we said before, looks nothing out of the ordinary. Having said that, it still has that sleek and elegant design that is typical of Hamilton Beach products. It comes in all silver and black and has a large handle for easy handling. The grill grates are on the top and bottom which means you can grill food from both the top and the bottom. The one thing that you will probably appreciate a lot are its adjustable hinges. The hinges allow the top grill to make room for big portions and cuts of meat. It also seems like a great way to press sandwiches! How does the searing process exactly take place? Do I have to keep adjust the temperature to achieve the sear on the food? Answer: Not at all. The Hamilton Beach 25331 grill will automatically come to a searing hot temperature of 500 degrees when you switch it on. After 10 seconds, it will have shared the food and then it will slowly reduce the temperature that you set for it. Does the top portion of the grill open completely to form a large grill? Answer: No, it doesn’t open all the way back. The design resembles more of a press grill. Cleaning the grills are very difficult since they aren’t removable. The drip tray tends to spill. Above all, the Hamilton Beach 25331 indoor grill is definitely not a disappointing product. It may not be the best grill we have seen (all thanks to its fixated grill plates and incompetent timer), but it is delivered and serves its purpose well. It is compact, has a smart user-friendly design and gets soaring hot; and for a price like that, we probably won’t get a better deal than this. In conclusion, we recommend it. This concludes our Hamilton Beach 25331 review. For more details, click on the product link. Thank you for staying with us. Until next time!